Reporters from Reuters recently became the first reporters to gain access to the Scarborough Shoal’s inner lagoon since China effectively occupied it in 2012. They describe the shoal as still dominated by both Chinese fishermen and law enforcement, but that Filipino fishermen are now mostly unimpeded from fishing both around the shoal and within its lagoon. Last July’s ruling by a UN-appointed arbitration court in a case brought by the Philippines against China did not make a determination with respect to which country has sovereignty over the shoal, but did find that China had unlawfully prevented Filipino fishermen from fishing in an area to which they were entitled, and required China to permit them access. While China rejected the legitimacy of the court ruling, these reports suggest it is nonetheless complying with its substance. While Scarborough Shoal remains a potential flashpoint between the United States and China, the presence of Filipino fishermen there should provide the United States with strategic reassurance about China’s intentions, as well as confidence that it could intervene in time if China’s intentions change. Starting in 2014 China embarked on a massive construction effort to build artificial islands out of reefs and other uninhabitable features it occupied in the Spratly island group in the southern end of the South China Sea. Seven features now comprise over 3000 acres of reclaimed land and house major surveillance, sensor, command and control facilities, as well as runways and hardened aircraft hangars. While China has not deployed any major weapons systems to Spratlys bases, they are capable of hosting significant power projection forces. Scarborough Shoal is much closer to the Philippines, only 120 nautical miles from the northern Philippine island of Luzon, and less than 200 nautical miles from the capital of Manila. That proximity, and the possibility that a conflict there between China and the Philippines could trigger obligations under the Mutual Defense Treaty between the United States and the Philippines, made it even more sensitive. 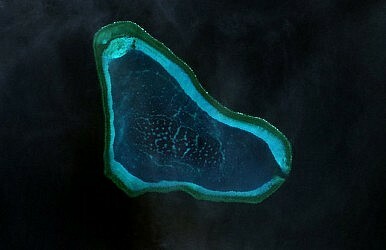 Together with China’s existing bases in the Spratlys and the Paracel islands to the north, many analysts believe that a similar facility on Scarborough Shoal would provide China with a “strategic triangle” permitting it to project military power over the entire South China Sea. When the Chief of the U.S. Navy revealed last March that China may have been conducting “precursor” surveys at the Shoal it apparently garnered a swift, but quiet, response by the United States to deter China from building on Scarborough Shoal as it had in the Spratlys. President Barack Obama reportedly even warned President Xi Jinping personally against such a move at their summit in Washington that same month. Since then, and since the July arbitration ruling, occasional Chinese reclamation “scares” over Scarborough Shoal seem to be either false or exaggerated. In September Philippines officials worried that new Chinese vessels near the Shoal were preparing to start reclamation, even though they were not equipped to do that work. Then as recently as this March, remarks by a local Chinese official prompted fears that China was going to build an “environmental monitoring station” on the Shoal this year. But later it seemed they had been exaggerated and taken out of context, and the Chinese Ministry of Foreign Affairs quickly and unambiguously denied that there were, or ever have been, such plans. These occasional reports distract from the fact that despite rejecting it, China appears to be following the terms of the July arbitration ruling to permit Filipino access to the Shoal, and has been since last fall. Recent reports like Reuters’ suggests that China’s accommodations to foreign fishing vessels, lately to include Vietnamese fishermen as well, have only increased. For its part, the Chinese Ministry of Foreign Affairs maintains its position that the Scarborough Shoal is sovereign Chinese territory, and that it nonetheless made an “arrangement” for Filipino fisherman, but without conceding the arrangement’s similarity to the terms of the July ruling. China’s accommodation of these foreign fishermen is a strong signal of China’s intentions that should reassure the United States, though not completely placate its concerns. Now that the fishermen are there, they can act as ‘canaries in the coal mine,’ warning of impending Chinese designs on the Shoal. If China suddenly revokes their access to the Shoal, it sends a clear strategic warning and indication to the United States to marshal diplomatic and military responses well before any construction would be able to take place. This means that China cannot attempt the island-building fait accompli that it executed in the Spratlys. And while China has blocked Filipino access to the Shoal before, it was in a very different strategic context. When Chine seized Scarborough Shoal in 2012, it seemed to be to assert sovereignty for fishing and economic rights, not military construction. China would not begin its reclamation of the features that it occupied in the Spratly Islands for another year, and it would be nearly three years before the scale of that island reclamation and the capabilities of the facilities China would build on them was clear. Now that those Spratlys facilities are complete, the stakes over the Scarborough Shoal are both higher and much more clearly understood by the United States. If China makes moves that seem to presage reclamation or construction at Scarborough Shoal, like evicting Filipino fishermen again, precedent shows that the United States will be quick to intervene again, and likely more forcefully than before. Knowing this, China is unlikely to do something with no guarantee of success, only of sparking a crisis with the United States. US Navy Destroyers Patrol Near China’s Man-Made Islands in South China SeaWhy China Might Seek to Occupy Scarborough ShoalChina Flies 'Strategic' Bomber Over Disputed Feature in South China SeaPhilippines Accuses China of Ramming Boats in South China SeaSouth China Sea: What Exactly Has Changed At Scarborough Shoal?